Royal Caribbean CEO Michael Bayley leaked the news that a Quantum Class ship will call Southampton home in 2020. In an interview, Bayley talked about the change, mentioning the cruise line had not yet made a decision which ship will be moved there for the summer, but it would likely be Anthem or Quantum of the Seas. Symphony of the Seas will have her sea trials next week. Royal Caribbean held a special Symphony of the Seas preview event in London. Our list of five things to love about Central Park on Oasis Class cruise ships. Check out our full review of Izumi on Brilliance of the Seas. According to a recent survey, Royal Caribbean is the most Instagrammable cruise line. Here is what we spent in total on our last Royal Caribbean cruise. We shared a photo tour of a Category 5D balcony stateroom on Brilliance of the Seas. Royal Caribbean released a new video of Adventurist Shay Mitchell in St. Maarten. The 236th episode of the Royal Caribbean Blog Podcast is now available and this week, Matt and John Bamber talk about learning to scuba dive on a Royal Caribbean cruise. Did you know that you can not only go scuba diving on Royal Caribbean, but learn and become certified in scuba? This week's episode is all about how you can try your hand at scuba during your vacation. 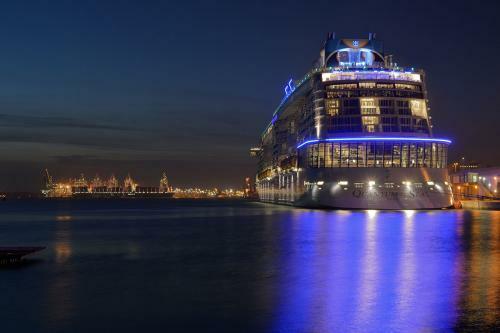 The Orlando Sentinel covered the changes coming to Mariner of the Seas. Eat Sleep Cruise shared the cheapest times of year to go on a cruise. Travel Weekly looked back at the last decade for Royal Caribbean Cruises Ltd.
Cruise Hive shared 50 Royal Caribbean tips and tricks.